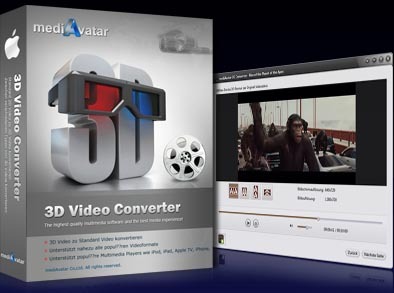 If you are a Mac user and happen to be a super fan of the amazing & breathtaking 3D movie, MediAvatar 3D Converter for Mac will be the last software you want to miss. With this professional and outstanding 3D movies producer, you can not only convert standard 2D videos to 3D videos or 3D to 3D videos, even 3D to 2D videos on your Mac. And nearly all the popular video formats including M4V, VOB, ASF, 3GP, 3G2, SWF, H.261, H.264, DV, DIF, MJPG, MJPEG and so on are supported. With MediAvatar 3D Converter for Mac, you can also set the start time and length of the video segment to get the favorite part converted to 3D. In addition, there are so many other parameters could be adjusted, such as video size, bitrate, sample rate, 3D depth, even the L/R Image could be swapped if you need. Convert 2D videos to 3D, various formats such as MP4, FLV, MKV, H.264/MPEG-4, DivX, XviD, MOV, RM, RMVB, M4V are all supported. If you prefer to watch your favorite movie in 2D, you can switch 3D movies back to 2D anytime. Play and preview 3D movies with its embedded media player. Preview videos and choose the original video format before converting. Setting various output parameters accordingly, such as resolution, video size, sample rate and so on to meet your specific needs in converting. Enjoy 3D video on a standard TV with Red/Cyan Anaglyph 3D video format outputted. 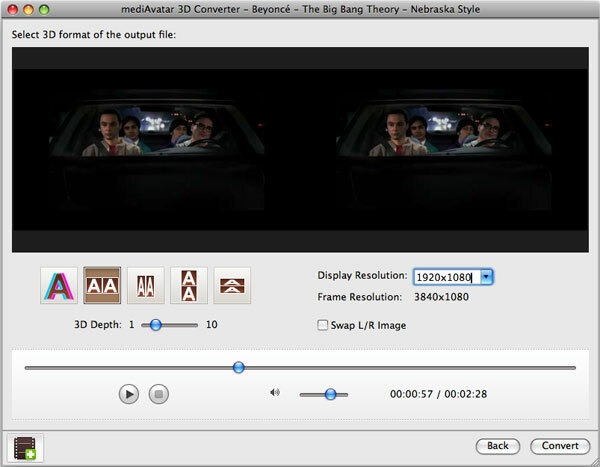 MediAvatar 3D Converter for Mac is a built-in media player which supports to play different videos. You can set the start time and duration of a video segment to get your favorite part converted. Support nearly all popular devices, e.g. iPhone, iPad, Apple TV, iPod, PSP, Xbox, General mobile phone, BlackBerry, General MP4 players, Android mobile devices and Windows Mobile devices. Interface languages are available with English, French, German, Japanese, Spanish, Italian, Portuguese, Simplified and Traditional Chinese.